We’re singing in Yiddish. Tomorrow is one year since survivor Emanuel “Mundek” Elbinger passed. He sang this medley every Shabbat here at the Jewish Community Centre. Now he’s buried at the New Jewish Cemetery down the street. We can’t see the street; the window shades are drawn between this room and the world. It’s a subtle but notable change that took place quietly nearly a decade after this building was opened in 2008, the year I first came to Poland. When I moved here in 2011, I’d peek out the windows at passersby during Shabbat dinners. I loved watching them look back curiously. 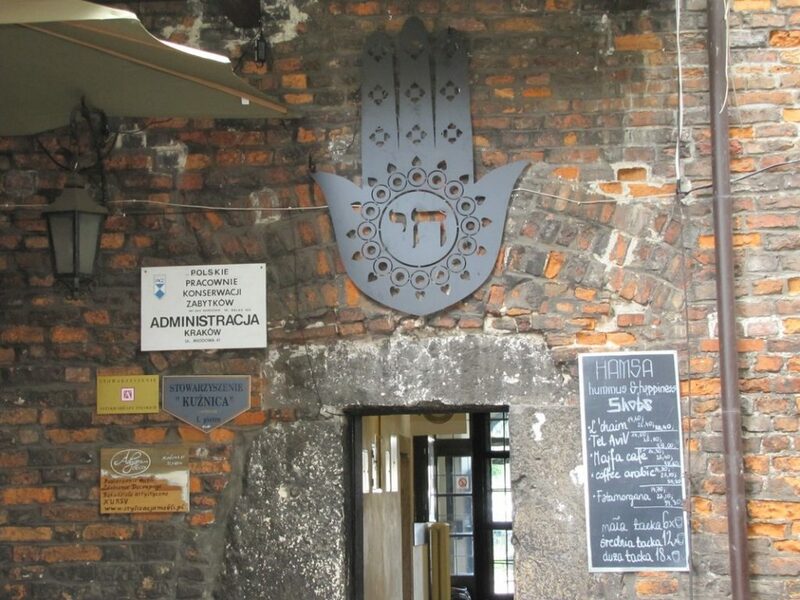 The attention to Jewish life and memory in Poland—with its local organizations, Jewish studies programs, tour groups, and in Kraków in particular with its annual Jewish Culture Festival, said to be the largest in the world—is significant. The pre-war estimate of 3.3 million Jews in Poland—in Kraków, roughly 20% of the population—may dwarf what exists now for those who limit their understanding to numbers. But for those who were fortunate enough to sit in this room when Mundek sang or hear survivor Zofia Radzikowska share the weekly Torah portion, it is clear that some things can simply be measured by the vibration felt when one encounters them. Even in the face of the recent “Holocaust law” this diverse community, which includes many non-Jewish Poles and an impressive mingling of sects, thrives. The JCC’s Executive Director Jonathan Ornstein wrote a New York Times editorial earlier this year addressing concerns the law raised. Passed in early 2018 then changed after the debate it sparked, the bill “criminalizes statements that the Polish nation had any responsibility in the Holocaust.” Naturally, it provoked a response outside this building. It’s impossible to dismiss the changes that have taken place since the right-wing government took power in 2015. One indicator: Poland’s Press Freedom Index rating continues to drop. The implications of these changes—including the recent law—inspired a panel that gathered a full house at this summer’s Jewish Culture Festival, titled “Our Voices: A Panel Discussion on Free Speech.” The panelists—Professor Edyta Gawron of Jagiellonian University, Maciek Zabierowski of the Auschwitz Jewish Center, photojournalist Omar Marques, writer and translator Lynn Suh of Massolit Books, and Jonathan Ornstein—shared their impressions, knowledge, insights, fears from their personal and professional perspectives. Perhaps the event alone was an act of defiance, a statement of resilience. We may not feel the impact of these laws or their sources today or tomorrow, but they have the potential to instill fear, edit history books, shift narratives, and curate new realities. I believe these panelists—a fierce group of intellectual activists willing to share—are amongst the voices that will reverberate past the censors. I’m running toward the river. Heavy bass pumps in my ears: ‘90s hip hop music, my go-to. Ever since I attended a discussion titled “Loving Music That Hates You—Navigating Misogyny in Music,” I can’t reconcile my desire to move my body to beats peppered with the voices of men calling us names. As a Miami native, this is particularly challenging. On the left is a row of storage units decorated with colorful graffiti, a set that I dream of choreographing a music video in front of. But when I envision dancing here, back to spray paint, facing the wall surrounding the Jewish cemetery, the stage does not compute. I see the street in between—a quiet local shortcut—as the link between worlds that couldn’t be further apart. This chasm is precisely the point of community, suggests Jessica Rosenberg, a friend studying at Harvard Divinity School who worked at JCC Kraków for a number of years. She illuminates the concept of community as the constant confrontation of past and present: encountering loved ones physically and spiritually on our commute, weaving the sacred into the fabric of daily life, making the most ordinary acts of life holy. She shares this at a hummus restaurant in Kazimierz, the historically Jewish district. Four of us—North American Jewish women in our early 30s—sit around the bar, share, laugh. This is not a Poland many imagine. Today, here, I’m an invisible minority. I’m reminded of walking through a remote south Indian village, wearing a kurta, wrapped in a pashmina. The curiosity is kind, but still alienates me from the norm in a way Poland, at first glance, does not. Once I experienced—not only imagined—being even an innocuous them, it was, it is, harder to identify as us. If everyone could experience this, if only briefly, would we be where we are? Could we feel so far from any being? The crosswalk was inconveniently placed so jaywalking here was the norm for me. In 2012, two policemen stopped me, caught in thought about the hip hop cemetery. They heard my Polish and shooed me away, but it was, it is, a pause that lingers. Since, a crosswalk has been paved on my path. We are sitting in the corner of the crowded office. Omar’s hands are folded gently, inconspicuously over his camera. Nobody seems to notice us, and that’s exactly the way we want it. We are here to observe; we are here to document. The Department of Nationals’ and Foreigners’ Affairs is a place most foreigners dread. My first visit in 2012 illustrated why: long waits, conflicting information, the word no. Rumor has it that the line to get a number forms before dawn, though I have not witnessed it myself. White knuckles clutch these deli counter tickets. Some complete their paperwork at a central table—adorned with migration brochures in Ukrainian and Vietnamese—most stare blankly at the floor, a phone, the overhead screen intermittently dinging with new numbers. Last summer I visited this office and suddenly found not what I dread, but what I crave: diversity. Every visit became an opportunity, between these walls plastered with posters of instructions, asylum programs, phone numbers that are not in service. The homogenous faces I saw on the streets seemed a world away from this room, filled with what felt like the population in a New York City subway car. When I met Portuguese photojournalist Omar Marques, who has been documenting the refugee crisis in Europe, I had a feeling he might be interested in an idea these visits sparked. This year, we visited the office a number of times to document the stories of people we met: an Iranian astrophysicist, an Ecuadorian business student, an Indian engineer, an American businesswoman, a Cuban chef, a number of Ukrainians, among others. We were amazed, inspired, to hear how many foreigners from many more miles away than us loved Poland the way we did; they felt safe here, welcomed here. It didn’t reconcile with the headlines. Przy Rondzie 6—a project aimed at becoming an exhibition in summer 2019—was our peek into a multicultural Poland that challenges the visual landscape and narratives gleaned from the street. Buzz by buzz, the audience is arriving. A rotating cast answers the plastic phone and presses the button. The peak of the new moon was moments ago and in about an hour we will begin the performance. Inspired by the 1997 study The Experimental Generation of Interpersonal Closeness, we are here to cultivate a space to consider the potential for closeness and distance in human interaction, despite and in light of barriers typically understood as limiting. I’m sharing the table with two local artists: Aleksandra Młynarczyk-Gemza and Stan Barański. She and I sit on each end of the table, simulating a banquet without a feast in between us; he’s situated in the middle, back facing the audience. Stan begins, directing alternate questions to each of us: Ola in Polish, me in English. We each answer in our mother tongue. Share with your partner an embarrassing moment in your life. What do you value most in a friendship? We end with four minutes of eye contact, an eternity when paralleled with research that reveals the “average optimal eye contact is 3.3 seconds.” SECONDS. We collect surveys from the small audience; we close after nearly an hour engaged in collective discussion. The piece was a reflection of my own transient decade, mostly based in Kraków, and a broader social commentary. One goal was to capture how verbal communication can both facilitate and limit connection, experimenting with the power of non-verbal engagement. It was an ode to alignment that transcends culture and comprehension; it illustrated what is lost and gained. For me, it led to the same vulnerability, presence, and gratitude that movement affords me. It was a reminder that these spaces can open the door to fear, and growth. I am lying on the floor, staring at a giant hole in the ceiling. I was aware of it, but now I can study it—its dank wood panels—as I writhe around, expanding and contracting my body. Others do the same but different, in their own corners of the room, surrounded by art hanging on the walls. I imagine my mother joking about not needing to sweep after this session. It’s my third consecutive day here for a workshop on an improvisational dance technique called Tuning Scores at the Kraków Art House. Our teacher, Nora Hajos, is gentle. I feel safe. Walking down the steep grass to the river nearby, I guide my partner while her eyes are closed. My job is to keep her safe. I revel in the responsibility of witnessing her freedom, unencumbered by visual cues of judgment. When we switch, I explore the grassy open space on foot, occasionally feeling the edge of the tiny steepness leading back home. I orient myself based on sounds: kids over here, construction over there, boats ahead. Eyes still closed, experiencing Kraków non-visually for the first time ever, my partner leads me up to the walking path. I’m tiptoeing, cautiously, she encourages me on. Suddenly we’re running, hand in hand. I’m terrified, waiting to fall, until I begin to trust her, a stranger, and I let go, not of her, but within myself. In that moment—if only for a moment—I was, we were, borderless. Dara Bramson is an interdisciplinary researcher based in New Orleans.